The Right Hand Drive and Left Hand Drive Toyota Fortuner 2009 is in our showroom for delivery. Toyota Hilux Vigo based Toyota Fortuner SUV PPV is wildly popular. Toyota Fortuner remains Sam Motors Thailand largest selling SUV since its inception its demand remains undiminished. Sam is Thailand's best 4x4 exporter and Toyota 4x4 remain our best selling vehicles, our Thailand division cannot keep with demand for Toyota Hilux Tiger, Toyota Hilux Vigo and Toyota Fortuner while our Dubai division Sam Motors Dubai cannot keep up with its demand for Toyota Hilux Surf, Toyota Landcruiser Prado and the higher end Toyota Landcruiser. For detailed specs of Toyota Fortuner please click on our http://www.sam4x4.com/fortuner.html or if you were looking for a brief intro check http://www.sonimotorsthailand.com/fortuner.html. An email at thai4x4@gmail.com will allow you to purchase either Right Hand Drive Toyota Fortuner or Left Hand Drive Toyota Fortuner if that is your fancy. Click here for specifications of 2009 Toyota Fortuner. 2009 Toyota Fortuner is in our showroom and we are shipping both Right Hand Drive 2009 Toyota Fortuner and Left Hand Drive Toyota Fortuner. Photos, images and details of minor change Toyota Hilux 2009 are here. Hilux Vigo pickup, bakkie, ute and Toyota Fortuner share much of each other DNA. The Fortuner wagon, like the pickup, uses a rugged ladder frame chassis and coil-spring front suspension with a double wishbone configuration, but for the SUV Toyota developed a four-link coil suspension set-up more appropriate to a luxury wagon. Although the Fortuner comes in at considerably lower pricing than Toyota's Land Cruiser models, it's very well specced. Three rows of seats provide accommodation for five adults and two kids, and the second and third rows can be folded, flipped and generally manipulated to provide loads of space for luggage. Fortuner G 4x4 Manual Transmission has CD MP3 WMA 1 CD. Fortuner V 4x2 Auto, Fortuner 2009 V 4x4 Automatic and Fortuner 2.7 V Auto have CD MP3 WMA 6 CD. Fortuner 2009 3.0 V Auto Navigator has DVD Player with 1 CD. Fortuner's name is derived from the adverb fortunate - quite apt as one of Toyota’s main objectives was to make it possible for many to own the SUV of their dreams. 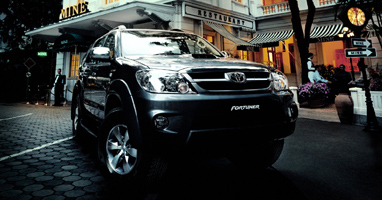 Toyota Fortuner is based on Toyota Hilux even though the luxurious interior does not betray its origin. It feels more like a Lexus than a Hilux but it is peace of mind to know that the beauty is powered by a sturdy beast that can handle all kinds of adverse terrains without a bother or sweat. Even before the release of Toyota Fortuner, Toyota Hilux Vigo and Toyota Hilux Tiger was our best seller and we still continue to export hundreds of Toyota Hilux Tiger along with nearly new and second-hand Toyota Hilux Vigo and Toyota Fortuner. Used Toyota Fortuner is now selling just as briskly as the brand new zero meter Toyota Fortuner. There is no better workhorse than Toyota Hilux whether in a farm or mine with the comfort of a luxury sedan. Single Cab Toyota Fortuner is only available in 4x2 but Extra Cab Toyota Fortuner and Double Cab Toyota Fortuner is available in both 4x2 and 4x4 configurations. For more details on Toyota Fortuner please visit our detailed Vigo page at http://www.sam4x4.com/vigo.html. Toyota 4x4s as Toyota Hilux Vigo, Toyota Hilux Surf, Toyota Fortuner, Toyota Prado and Toyota Landcruiser are loved and admired the world over for their distinctive look, best quality, reliability and comfort. Toyota Hilux became popular right after its release some five decades ago an continues its popularity with the advent of Toyota Hilux Vigo and Toyota Fortuner. It has latest 4x4 technology that make it an offroader dream vehicle while building on its reliability, performance, comfort. Based on Toyota`s new IMV (International Innovative Multi Purpose Vehicle) platform, the Fortuner benefits from a parallel development process alongside the Hilux bakkie models. Email us now at thai4x4@gmail.com to acquire your very own Toyota Fortuner or nearly new or used Toyota Hilux Vigo or Toyota Hilux Tiger or email thai4x4@gmail.com to acquire Right Hand Drive or Left Hand Drive Toyota Hilux Surf, Toyota Prado, Toyota RAV4 or Toyota Landcruiser or any Toyota of your dream. Come time for a service, owners will also be pleasantly surprised to find that the replacement parts basket of the Fortuner is very competitively priced at Sam Motors Thailand. This is largely due to the fact that Sam has always delivered lowest prices for the past 97 years. Incidentally, the Fortuner comes with a whole range of optional accessories and you can browse them at http://www.sam4x4.com/accessories.html.